I’m really fussy about the ripeness of my bananas. I don’t like them underripe when they stick to your teeth a bit and I don’t like them as soon as they start to get spotty and taste too banana-ey. What a fusspot! 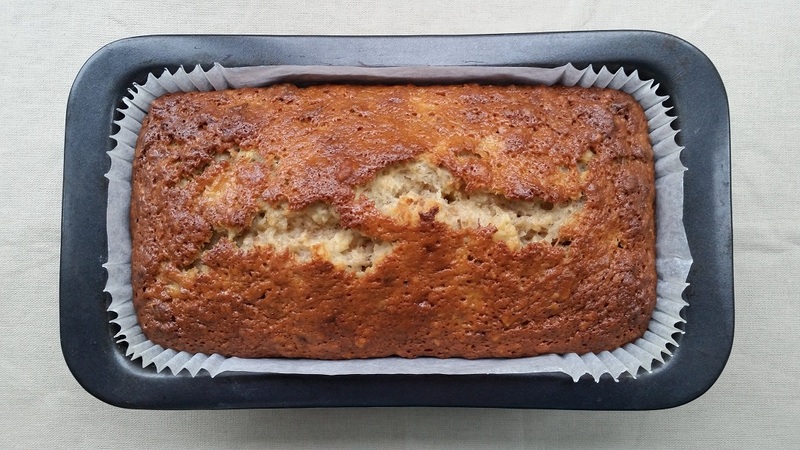 This leaves me with a very small window of opportunity to enjoy my bananas so I’m always on the look-out for recipes for using up overripe bananas and this is my current favourite. The original recipe came from a book called Cakes & Slices by Murdoch Books. That recipe includes grated dark chocolate which I have omitted and I’ve also reduced the amount of banana slightly. You’ll see in the pictures that I’ve lined my tin with a special loaf tin liner . My Mum introduced me to these and they’re a real treat to use. No faffing about with greaseproof paper and no need to grease the tin. They are a bit of an extravagance but worth it I think for the convenience. I’m a great believer in making things easier so I’m more likely to actually do them! 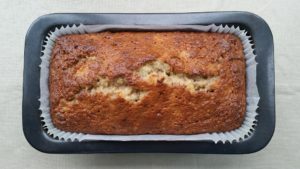 I find that this cakes keeps well in a tin for a week but it’s most delicious when it’s still slightly warm and the edges are a bit crunchy. 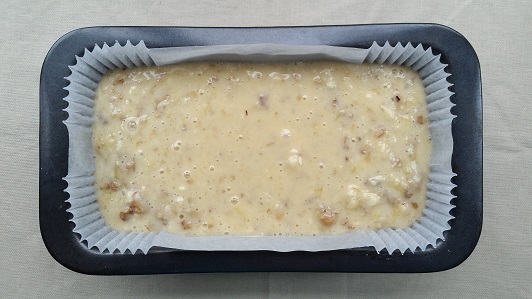 Grease and line a 2lb loaf tin (approximately 10 x 20 cm) or use a silicone loaf tin liner. Use a fork to mash the bananas in a mixing bowl. Add the flour (sifted), eggs, oil and milk and stir for 30 seconds. Add the walnuts and mix in gently. Bake for 50-55 minutes, until a skewer inserted into the middle of the cake comes out clean. Leave in the tin for 5 minutes. Turn the cake out on to a wire rack and leave to cool.